Free response practice questions are posted on this site on the hope that you will try to answer them yourself so that practice makes you confident in facing the AP Physics Exam. You must finish your answer within the stipulated time. Proper units of the quantities appearing as answers should be given to avoid unexpected reduction in the points you expect to score. Model answers to the free response questions are posted on this site after a delay of two or three days so that you can compare your answer with the model answer and judge your strength and weakness. Two metal plates A and B, each of area 0.2 m2 are arranged parallel to each other as shown, with a separation of 1 cm in air. 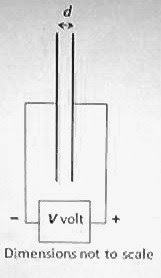 A regulated direct voltage source of output V volt remains connected between the plates so that there is an electric field of 2000 N/C in the region between the plates. (a) Determine the output voltage V of the regulated voltage source. Give reasons for change (if any) and for no change (if any). (d) During the decrease in the separation between the plates, will there be a current through the wires connecting the plates to the voltage source? Justify your answer. (e) Determine the energy of the capacitor when the separation between the plates is reduced to half the initial value. The above question carries 15 points. You can take about 17 minutes for answering this question. (a) The space between the shells is filled with air of dielectric constant very nearly equal to 1. Calculate the potential difference between the shells. (b) Determine the electric field at a point in between the shells, at distance a from the common centre of the shells. (c) What are the values of the electric field and potential at a point outside both shells, at distance b (b > r2) from the common centre of the shells? 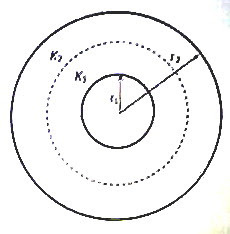 (d) Determine the potential at the common centre of the shells. The above question carries 15 points. You can take about 15 minutes for answering this question. Try to answer these questions. I’ll be back soon with model answers for your benefit.